Over the course of a few weeks, I have worked with nothing but triangles! And today I am finally able to share with you this elaborate collection of handcrafted goodies. We could all do with a bit of isosceles in our lives (+ scalene, equilateral, and so on) and this pack provides exactly that. 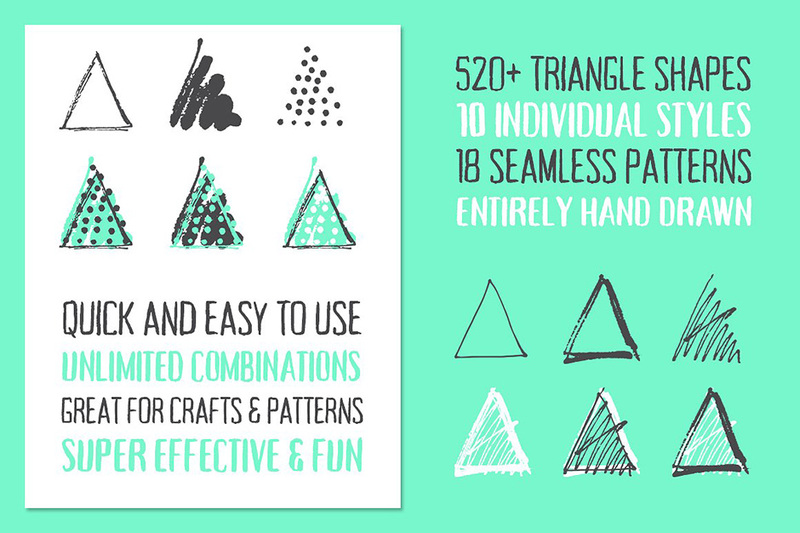 Working with these triangles is great fun, and super easy. Simply cut and paste your desired shapes and styles, tweak till your hearts content and you will have an entirely unique and creative shape (see second image!) that’s great for many crafty and design applications. Software compatibility: Adobe Illustrator CS. .PNG files will work with most graphic software. File size is approx 103.6MB (104.3MB unzipped), offered as a single download.